Hadrians Wall Path is an 84 mile linear route that follows the worlds finest surviving Roman frontier from Wallsend, near Newcastle to Bowness-on-Solway, near Carlisle. The path runs almost coast to coast across the narrow isthmus at the top of England. The idea to create the Wall, and prevent the attacks and movements of the Celtic Barbarians from the North (Scotland), was that of Roman Emperor Hadrian Aelius. In AD122 work commenced on the near ten year task to build the Wall and its forts, milecastles and turrets. Some fifteen thousand men from 3 Roman Legions were employed in the task. For over 250 years the Wall served to protect the Roman Empire until their retreat. The Wall stood intact for a further 1000 years until the need for stone brought about the dismantling of the Wall. This process continued until 1822 when landowner John Clayton protected and rebuilt the Wall passing through his estate, by purchasing land alongside the Wall he managed to protect remains as far as Cumberland (Cumbria). Some other sections of the Wall have since been rebuilt by English Heritage. In 1987 Hadrians Wall became a UNESCO World Heritage Site. In 2003 the long awaited Hadrians Wall National Trail was opened. Great efforts have been made to keep the trail close to the line of the Wall. This is amoderate trail, though there are some steep ascents and descents in the mid sections of the walk Generally the path follows a grassland route with paved and tarmac sections, particularly at start and end of the trail. Each night on the trail you stay in a different location in selected accommodation, with breakfast provided. Your luggage is collected daily and moved to your next accommodation. The popular direction to walk the route is from East to West but we also operate West to East holidays. You can start your Hadrian's Wall self-guided holiday on any date of your choice between April and October. *Single supplement - There are very few single rooms along the route and therefore the accommodation owners generally allocate a double or twin room for single occupancy. We can accommodate one single occupancy per booking for the average supplement of £25 per night. If you require additional single occupancy rooms, they will be charged at the extra cost incurred. This can be up to full double/twin room rate. We describe the holiday in an East to West direction but you can also walk from West to East. Generally a moderate route though some strenuous walking is encountered crossing the Pennine Hills in the mid section of the route. Generally the path follows a grassland route with paved and tarmac sections, but rocky paths will be encountered in the Pennine mid section of the route. Evening meals, packed lunches, drinks and snacks, travel insurance, travel to Newcastle and from Bowness-on-Solway, souvenirs, laundry services, etc. Accommodation is provided in carefully selected walker friendly B&Bs, Guest Houses, small Hotels and Inns. We aim to book rooms with ensuite or private facilities every night, however in a few villages ensuite accommodation is limited and we may have to book rooms with shared facilities for one night of your holiday. For the duration of the holiday your luggage is transferred from accommodation to accommodation by a luggage transfer agent. Luggage allowance is 1 bag/person weighing not more than 18kg (40lbs). Hadrians Wall Path is an 84 mile linear route that follows the worlds finest surviving Roman frontier from Wallsend, near Newcastle to Bowness-on-Solway, near Carlisle. The path runs almost coast to coast across the narrow isthmus at the top of England. The idea to create the Wall, and prevent the attacks and movements of the Celtic Barbarians from the North (Scotland), was that of Roman Emperor Hadrian Aelius. In AD122 work commenced on the near ten year task to build the Wall and its forts, milecastles and turrets. Some fifteen thousand men from 3 Roman Legions were employed in the task. The following is intended to provide further information about the route. Please note that all distances and heights in this document are approximate and along with all the other information are provided as an aid to describe the route. Wallsend (height above sea level 5m) to Wylam (10m)/Heddon-on-the-Wall (120m). The start of Hadrian’s Wall Path is in Wallsend, Newcastle at the remains of Segedunum Roman Fort. Not since the end of the Roman occupation of Britain, some 1600 years ago, has it been possible to walk along the entire length of Hadrian's Wall. The first section of the route from Wallsend to Chollerford is generally easy walking. From the fort the route follows alongside the River Tyne, passing the shipyards and Newcastle’s industrial centre for the first several miles. The route leads through Newcastle Quayside, a vibrant area with restaurants and cafes. The bridges, including the tilting Millennium Bridge ('Winking Eye Bridge') link Newcastle to Gateshead. Continuing to follow the direction of the river the route passes Newburn (5m). In a few miles the route meets the Wylam Waggonway. Hadrian’s Wall path turns right away from the river to Heddon-on-the-Wall, a short walk across farmland, but continuing along the Waggonway for a short distance brings you to Wylam birthplace of George Stephenson. At Heddon-on-the-Wall is the first section of the Wall and evidence of Roman construction. Wylam (10m)/Heddon-on-the-Wall (120m) to Wall (100m)/Chollerford (100m). From Heddon-on-the-Wall the path leads into the countryside and continues its way over mainly level terrain alongside the line of the old military road, where the Wall once stood. To the north side of the road you will see the ditch in places and the occasional ridge in the fields to the south. Today the B6318 road is dubbed the military road, not on account of the Romans, rather General Wade, builder of military supply roads in the 18th century in response to the Jacobite rebellion. The route is almost straight and passes the hamlets of Wallhouses and Halton Red House. At the junction with the A68 road is Portgate (200m), which was the junction with the Wall and Dere Street, the main Roman road into Scotland. The historical market town of Corbridge is a few miles to the south of the path. The path passes St. Oswald’s Church at Heavenfield (220m), the site of a 7th century battle between Northumbrian forces and an invading Welsh army. The battle was a decisive victory for Oswald, King of Northumbria. The 97 mile St. Oswald’s Way long distance walking route leads from Holy Island to Heavenfield, and Hadrian’s Wall path and St Oswald’s Way have been following the same path for the last few miles. The route passes close to the village of Wall and then leads a mile to Chollerford. Here are the ruins of Chesters Roman Fort and Chesters Museum, open daily from April to September. Wall (100m)/Chollerford (100m) to Steel Rigg (280m). On this stage there are the most complete sections of the Wall, forts, milecastles, turret sections and wonderful views as the Wall crosses the Pennine Hills. The path continues to follow the line of the military road for several miles and climbs gradually as it ascends into the Pennine’s. The path passes Limestone Corner, the most northerly point of the Wall. Near milecastle 34 (250m) the road turns away from Hadrian’s Wall and the Wall crosses the rough and rugged landscape of the Pennine Hills. The Wall was built on a line of rocky Crags which created a high defence to potential invaders from the north. There are excellent views of the surrounding area and Northumberland National park. For the next several miles the path rises and falls as it crosses the Crags, passing Housesteads Fort (275m) on route to Steel Rigg. Approximately 2 miles from this point is Vindolanda Fort, both Vindolanda and Housesteads are open daily from April to September. Steel Rigg (280m) to Banks (120m). For the next few miles Hadrian’s Wall Path continues its route over the Crags alongside good sections of the Wall. The path reaches its highest point at Windshields Crags (345m). There isn't very much between yourself and the Shetlands, a wasteland occupied by ‘The Barbarians’, or so the Romans called them, two millennia ago. This section of the path is also shared for a few miles by 268 mile Pennine Way long distance National Trail, an upland walking route which leads from Edale in Derbyshire to Kirk Yetholm in the Scottish Borders. At Walltown Crags there are views of southern Scotland and the Northern Pennines, and in the distance the Solway Firth. The landscape changes and the path crosses into Cumbria and over farmland to the village of Gilsland (130m). A mile further along is Birdoswald Fort (open daily from April to September). The path continues across farmland for a few miles to the hamlet of Banks. Banks (120m) to Carlisle (15m). Hadrian’s Wall path now continues across farmland, there are no ruins of wall or forts to be seen on this section of the walk, but the occasional humps and bumps in the ground and glimpse of vallum ditch show the line of the Wall. A few miles after Banks is the village of Walton (80m) and shortly after the village of Newtown (70m). The terrain levels and in a few miles meets the River Eden at Crosby-on-Eden (30m). From here the path alternates from roadside to riverside walking as it makes its way to the border City of Carlisle, close to the Scottish border. The Romans established a settlement here to serve the forts on Hadrian’s Wall. Carlisle Castle is a great medieval fortress which houses the Border Regiment Museum. 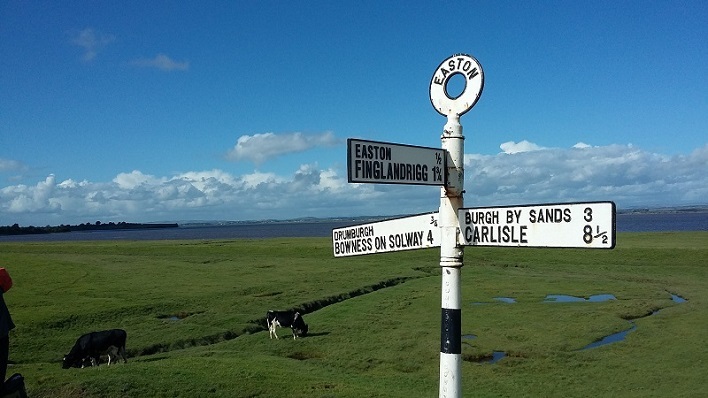 Carlisle is also at the end of the 70 mile Cumbria Way long distance walking route which crosses the Lake District from Ulverston at the southern end. Carlisle (15m) to Bowness-on-Solway (5m). The Path leaves Carlisle alongside the banks of the River Eden, which is winding its way to the Solway Estuary. The walking is almost level. A few miles out of Carlisle the path leaves the river to pass through the village of Burgh by Sands (20m). For the last 7 or 8 miles to Bowness-on-Solway the path follows a road alongside the peaceful Solway Estuary. There are wonderful views across the estuary to the hills in Southern Scotland. In the village of Bowness-on-Solway a small shelter and pretty garden mark the end of the walk alongside this historic ancient frontier. The train station in Newcastle is a short taxi journey, or Metro train journey from your accommodation. Approximate journey times – From Manchester 3 hours. Approximate journey times – From London Kings Cross 3 hours. The nearest train station is Carlisle which is a 45 minute bus journey from Bowness-on-Solway. Note buses do not operate on Sunday's so you will need to travel by taxi. Approximate journey times – From Carlisle to Manchester 2 hours. Approximate journey times – From London Euston 4 hours. There is a bus stop a short walk from your accommodation. The bus stop in Bowness-on-Solway is a short walk from your accommodation. Limited non-secure parking is available in Bowness-on-Solway. Please contact us if further information is required. From Newcastle Airport travel by Metro train to your accommodation. Approximate journey times 35 minutes. Travel by bus to Carlisle (see above) then train Carlisle to Newcastle, and Metro train from Newcastle Central to the Airport. Total approximate journey times 3 hours. From Manchester Airport travel by train to Newcastle then Metro train to your accommodation. Total approximate journey times 3 hours 30 minutes. Travel by bus to Carlisle (see above) then train to Manchester Airport. 2. Keep your suitcase/luggage under the maximum transfer weight (Maximum: 18kg (40lbs)). 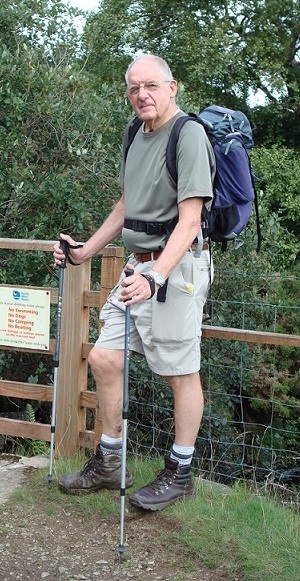 Dear Dean…I wanted to thank you for the organisation of my holiday walking Hadrian’s Wall. Everything went according to plan and the accommodation throughout the trip was super. Hello Dean, I really enjoyed St Oswald's Way and Hadrian's Wall, thanks for organising it for me. Everything went well and the weather was kind. I wish to congratulate you on a superb holiday last week on Hadrian walk. The Bed and Breakfasts you booked for us was fantastic and the luggage transfer was great! Hello, I really enjoyed doing Hadrian's Wall, all of the accommodation was of a really good standard and everything went very smoothly. The accommodation owners were all very helpful. Thank you for organising it. 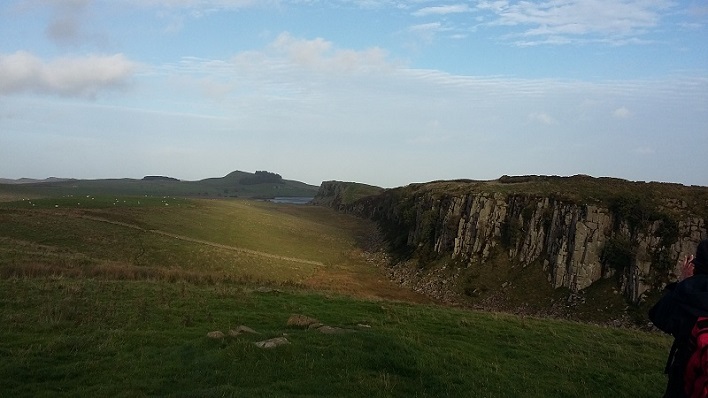 Just a quick report on our return from a very good Hadrian's Wall walk. The B & B selection was superb, the paperwork as usual immaculate! Once again many thanks for a great time, we are thinking about next year's walk! Dean and Corinna, Julia and I have just completed our Hadrian's Wall walking and I'm just letting you know what a lovely time we had. The weather was glorious, almost too hot! And the B&B’s were all delightful and we were looked after extremely well by everyone… we had a wonderful time and thoroughly enjoyed the whole walk. You certainly have a well-oiled system going with the directions to the accommodations and the baggage transfers. Thank you and maybe we'll dust off our walking boots and join again in the future. Thank you for assisting us over the holiday break witht the organization of our accommodation and luggage pickups for our trip along Hadrian's Wall. We loved the walking in the country, loved the history, the fact that there were not huge numbers of people out and about, and will certainly be doing it again - there is still much for us to explore. Just to let know we had a great holiday, everything went smoothly along hadrians wall walk, b&b were good and met some great people. Many thanks. Just to let you know I had the most fantastic time on the West Highland Way and Hadrian's Wall Path. Many thanks for the wonderful organisation and fabulous accommodation you booked for me, every place was perfect. Thanks for a great trip. Just a note to let you know I have reached Bowness on Solway, the end of the trail. Before departing tomorrow, I want to thank you once again for all of your assistance. The accommodations were terrific, the luggage transfers were flawless, and your customer service was impeccable. 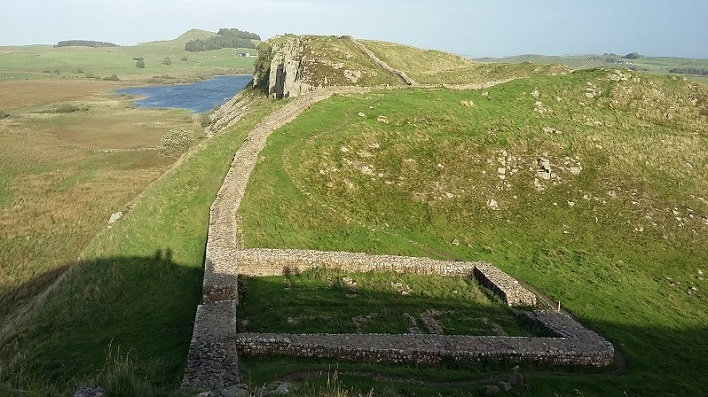 Like last year's coast to coast walk, the Hadrian's Wall walk surpassed all of my expectations and I look forward to booking with Northwestwalks in the future. Just a quick note to say how much I and my 3 friends enjoyed our walk. …The good accommodation, friendly people and faultless baggage transfer was arranged by you in an efficient way. Thanks for making our trip so enjoyable. Just wanted to let you know how pleased we were with the organisation you did for our holiday walking Hadrian's Wall. The whole holiday was superb. … We shall have no hesitation in contacting you again next year when we decide which walk we will do.